A wash within a valley located in Apache County, Arizona. This wash flows northwest into the larger Lukachukai Wash and was named “Salt Water Wash” in Spanish by 20th-century hydrologist Herbert Gregory from the United States Geological Survey. 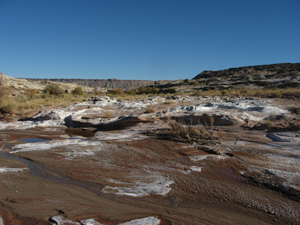 The Navajo name for Agua Sal Wash is Tó Dík’ ǫ́ǫ́zh (Saline Water). "Example of a saline wash in the Four Corners region, October 17, 2009" by Ken Lund is licensed under CC BY-SA. N.d. Agua Sal Wash Physical Feature (Valley) in Apache County. History. Salt Lake City: University of Utah Press.